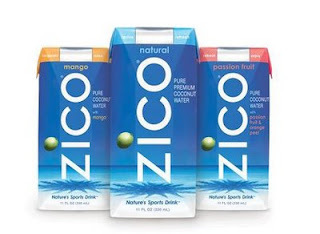 In the aftermath of my older sister's wedding this past weekend, there was a need to clear out some of the things that were falling out of the fridge at my parents' house due to leftovers, so I ended up with this 60-calorie Zico coconut water in my lunchbag. I couldn't wait until lunch, so I sipped on this clear liquid that claims to have more potassium than a banana and 5 electrolyte types. As you may know, potassium and electrolytes are supposedly the stuff in sports drinks that help with dehydration and cramping. The first thing I wondered while opening this was, "where's the straw?" but then I saw that it just has a wide mouth to drink from. I took a few sips of the passion fruit flavored one, and it tasted like a slightly thicker version of water with a hint of flavor in it. I was not all that impresed, but the benefits of the drink seem to justify me trying it again when my training hits higher points. In regards to the aforementioned wedding, I had such a good time just seeing everyone look so nice and happy seeing the handsome couple. The attendance of my cousins really livened up the event even more. My mom looked really, really beautiful, my dad was so unusually *emphasis* cheerful, the sisters were excited, the boyfriend showed up looking sharp, and of course, the bride was just about the most stunning ever. It is weird not to have her living at the house anymore, even though she is not far away at all, but I think things will be more normal again after a period of adjustment. I've always liked coconut water, but I tried one recently that came out of a can, and all I could taste was metal! I know tfh uses it as her hydration during her runs instead of gatorade, so I'm curious to give that a shot one of these days.